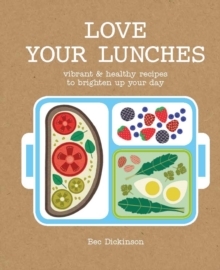 Liven up your lunch box with this vibrant and creative cookbook, helping you to transform your lunchtimes. Whether it is a lunch on the go, eating at your desk, or a catch-up with friends or colleagues Love Your Lunches has over 50 inspiring ideas to brighten up your afternoon meals.From a red lentil, squash and coconut dal to a quick and fuss-free sushi bento bowl, each recipe is nutritionally balanced, easy-to-make and mouthwateringly delicious. Learn how you can adapt last night's leftovers for an exciting lunchtime meal, batch meals you can freeze ahead, fast lunches you can whip together in the morning, in a matter of minutes, as well as fresh and cost effective ideas for those days when you haven't got the time to make your own lunch at home. There are also ideas for toppers, snacks, shared lunches and that innevitable 4 p.m. slump. Taking just 30 minutes or less to prepare, all the recipes are easy to adapt so you can easily mix and match your lunch to your own personal preference.With a fun and playful design and recipes that are healthy yet satisfying and full of flavour, Love Your Lunches will help you to reclaim your lunch break.